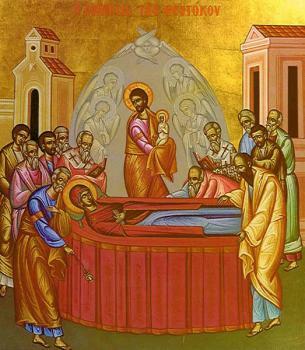 Today we continue celebrating a great feast of the Church, the Feast of the Dormition of Mary the Thetokos When we think of the Virgin Mary, we cannot help but marvel at the unique and glorious role that she plays in our salvation. For the Son of God to humble Himself to the point of becoming a human being, He had to have a mother. God entered into creation and became one of us through her. She was truly the temple of the Lord in her miraculous pregnancy. And Mary had the astounding role of raising Jesus Christ, of nursing, loving, and guiding Him as any mother does for a child. She lived a life of great piety and purity all her days, and the tradition of the Church teaches that the Theotokos was a much loved and respected figure in the early Christian community in the years following Christ’s death, resurrection, and ascension into heaven. Our Lady the Theotokos is herself an icon of our salvation. She models for us what it means to accept Christ and to love and serve Him. Her death and ascension are reminders of our destiny, of our hope, for the fullness of eternal life in the Kingdom. And now she is with the Lord in heaven, praying for us—for the Church and the entire world– interceding with her Son on our behalf with the boldness of a mother—the same boldness that she demonstrated in asking Christ’s to help with the shortage of wine at the wedding in Cana of Galilee. That was His first miracle in John’s gospel, and He did it upon the request of His mother, even as He continues now to respond to her prayers. No, we cannot fully understand the mystery of the eternal Son of God having a human mother or of their relationship to one another. For these amazing truths are part of the great miracle of the Incarnation: that Christ really did become one of us in order to make us partakers of the Divine Nature, in order to bring us into His eternal life. And Mary the Theotokos is the prime example of one who is truly united with Christ, who shines with His holiness. Throughout her life, she led the way in loving and serving Christ; and upon her death, she led the way into the life of the Kingdom. If we want to follow her example of participating so fully in the life of God, we need to take very seriously our Savior’s parable in today’s gospel reading about the importance of forgiveness. A servant owed his king more money that he could possibly earn in his entire life. When he couldn’t pay, the master was ready to sell him and his entire family in order to cover the debt. But the servant begged for more time to pay, and the master showed mercy even beyond his request. He actually forgave the debt; the man owed nothing and he and his family were safe from punishment. The Lord’s point is that if we are participants in the Divine Nature, if we are truly in Him, we must forgive and forget; we must show others the same love and mercy that He has shown to us. Remember what the one who told us to forgive seventy-times seven said from the cross, “Father, forgive them for they know not what they do.” There is no limit to the forgiving love of Jesus Christ. And if we are in Him, there can be no limit to our forgiveness either. We who want His mercy must show it to others. Otherwise, we reject Him and condemn ourselves. If we are honest, we will admit that we all have lots of room to grow in forgiving those who have offended us. Unfortunately, we find it much easier to judge, hate, and condemn than to love and forgive. For ever since the fall of Adam and Eve, we have distorted our relationships with one another, allowing fear, judgment, and insecurity to separate us. Early in the book of Genesis, their descendent Lamech brags that he will avenge himself seventy-seven fold. In other words, if you accidentally bumped into him he would kill you and your entire family. You wouldn’t want to mess with him. Well, our desire for revenge probably doesn’t go that far. We may not avenge ourselves seventy-seven fold, but we often find it almost impossible forgive seventy times seven. Remember the words of St. John’s Epistle: “If someone says, ‘I love God,’ and hates his brother, he is a liar.” It is only by the power of the Holy Spirit in our hearts and souls that we will find the strength to stop lying in this way, to treat others as Christ has treated us. Like any other area of weakness in the Christian life, the struggle to forgive should begin with confession, with an honest acknowledgement before God that we hold a grudge against someone else, that we have not forgiven that person. Even as we ask for God’s forgiveness, we should ask for His help in being reconciled and forgiving completely whatever wrong has been done. We must treat them with mercy and also pray for those who have offended us, asking God’s blessings on them. And when we are tempted to dwell on what they have done or to judge them, we must immediately turn our attention to the Jesus Prayer or at least to something else that distracts us from this temptation. No, none of this is easy. None of it is immediate. But if we consistently turn away from unholy thoughts, they will lose their power over us. If we get in the habit of not paying attention to them, they will diminish. And then we will enjoy a new freedom to forgive our enemies from our hearts, to replace grudges and resentment with love, to be at peace with them, as much as it depends on us. We rarely think of the Theotokos in relation to forgiveness, but have you ever noticed that we have no record of her judging or condemning those who murdered her Son? That’s truly remarkable and a sign of her great holiness. Even as He prayed from the cross for the Father to forgive them, Mary held no grudge either. Imagine that: a mother not being consumed with hatred for those who crucified her only child. So during this time of the Dormition, let us look to the Virgin Mary as a living icon of our salvation, of what it means for a human being to love, obey, and participate in the life of God. Let us follow her example of holiness in how we live and die, and especially in how we forgive. It’s comforting to know that we do not make up the Christian life as we go along. Instead, we are surrounded by a great cloud of heavenly witnesses who have paved the way and who cheer us on in our journey to the Kingdom. First among them is the Most Holy Theotokos and Ever-Virgin Mary. By her prayers and the mercy of her Son, let us follow her into the joy of life eternal.